Not every battle is fought with flesh and steel. Others are fought in the backrooms of lavish parties or in hushed conversations overheard by no one but the wind. In the City of Lies, every polite interaction can become a waging war. 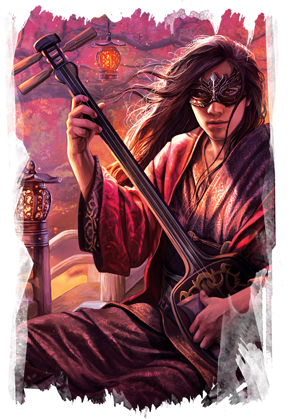 Fantasy Flight Games is proud to present "In the Garden of Lies (Part 1)" by Marie Brennan, a new piece of fiction set in the world of Legend of the Five Rings that can be downloaded here (1.5 MB). "In the Garden of Lies" sees the Scorpion and Dragon clan intersect with one another as the charismatic Yogo Hiroue looks to learn more about the mysterious Kitsuki Shomon. Check back in two weeks for the conclusion to "In The Garden of Lies," as we proceed ever closer to the launch of Legend of the Five Rings: The Card Game! Be sure to return to the Fantasy Flight Games website for new fiction every other week, and dive into the world of Rokugan with Legend of the Five Rings: The Card Game (L5C01), available in the fourth quarter of 2017!